The engineering team uses the same mechanism internally for tracking and fixing bugs, so please us Feedback Hub and report any bugs you are seeing; we are listening! Open the Windows Settings app. 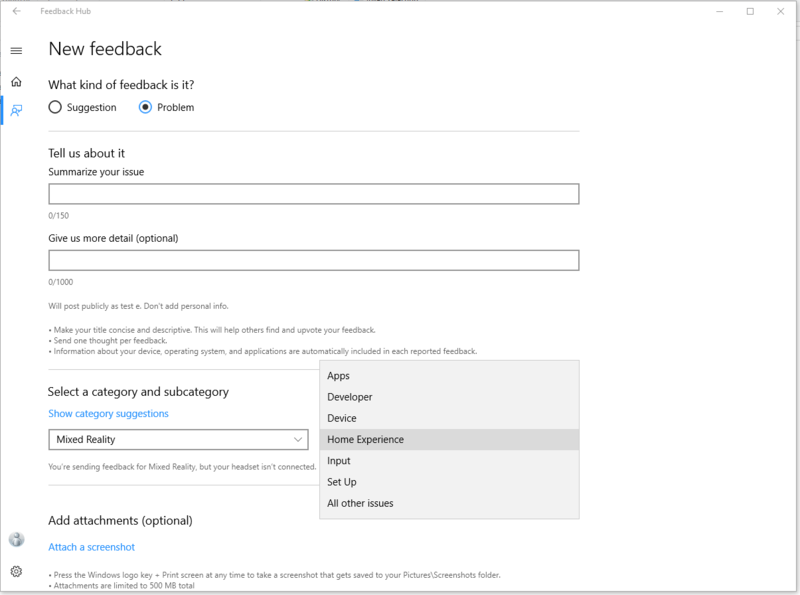 Go to Feedback & diagnostics on the left pane (note that this has been renamed to Diagnotics & feedback in recent Windows Insider builds of Windows. 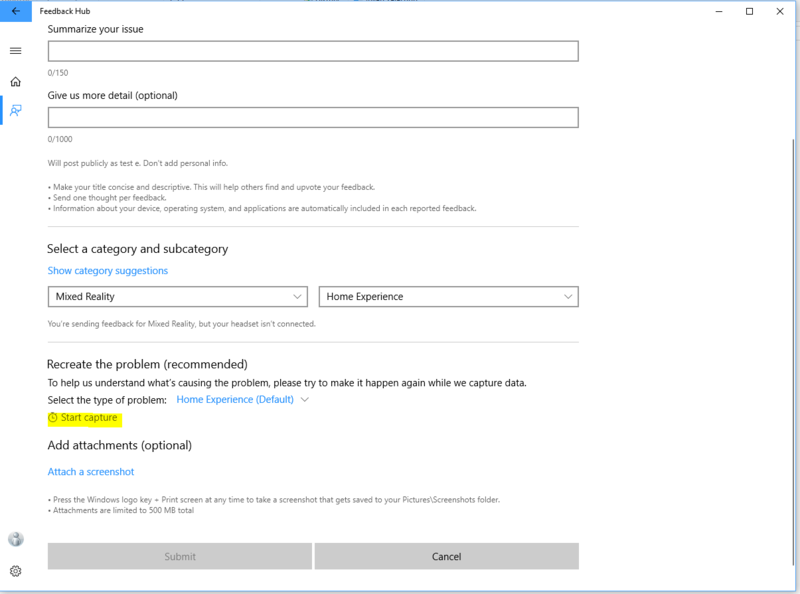 Under Select how much data you send to Microsoft, select Full if it isn't already selected. Be sure to restart your PC and repeat the steps to reproduce your issue before filing feedback. Ensure you have the immersive headset connected to your PC. Launch Feedback Hub on desktop with the HMD connected. Go to Feedback Tab on the left pane. Click Add new feedback button to enter the feedback. Select Problem in What kind of feedback is this? to make the feedback actionable. Provide meaningful feedback title in Summarize your issue box. Provide details and steps to reproduce the issue in the Give us more detail box. Apps Issues with a specific application. Developer Issues in authoring / running an app for Mixed Reality. Device Issues with the HMD itself. 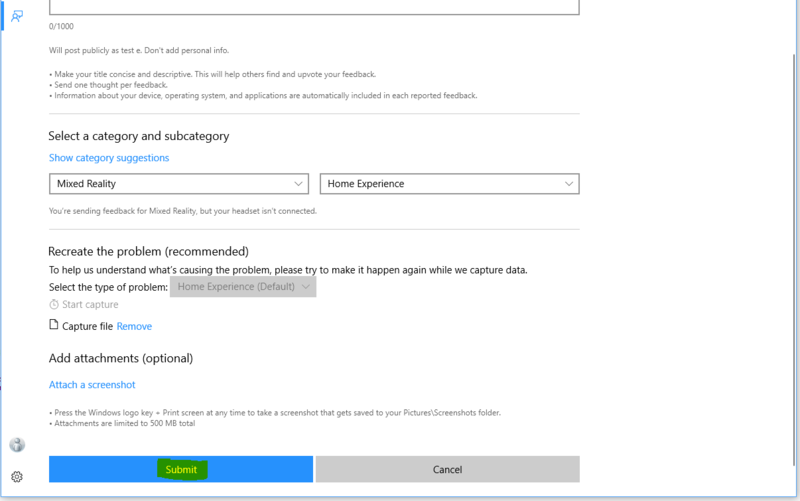 Home experience Issues with your VR environment: interactions with the Windows Mixed Reality Home. Input Issues with input methods: motion controllers, speech, gamepad, or mouse and keyboard. Set up Anything that is preventing you from setting up the device. All other issues Anything else. To help us identify and fix the bug faster, capturing traces and video is extremely helpful. To start collecting traces, click on Start capture. This will begin collecting traces and a video capture of your mixed reality scenario. Leave the Feedback app and run through the broken scenario. Do not close the Feedback Hub app at this point. After you are done with your scenario, go back to the feedback app and click Stop Capture. Once you do that, you should see that a file containing the traces has been added. This will lead you to the "Thank You" page. At this point, your feedback has been successfully submitted. After you submit feedback, to easily direct other people (e.g. co-workers, Microsoft staff, forum readers, etc.) to the issue go to Feedback > My Feedback, click on the issue, and use the Share icon to get a shortened URL you can give to others to upvote, or escalate. Before filing a bug, please ensure you meet the following constraints so that the logs are successfully uploaded with the feedback. Have a minimum of 3GB free disk space available on the main drive of the device. Ensure that a non-metered network is available in order to upload cabs. Make sure to check back regularly with Feedback Hub after filing feedback! In most cases, we'll try to respond as soon as we can. If you're not already in touch with us when you file feedback, the only way we can reach out to you with troubleshooting suggestions or more questions is via the comments system in Feedback Hub. Unfortunately, at this time, notifications are not sent to you outside of Feedback Hub.